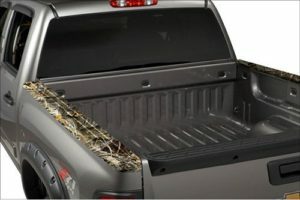 What are the best Camo Truck accessories for my Pickup or SUV? Alright Mother Truckers, if your reading this post then you are probably an outdoor enthusiast who loves camping, hunting, fishing and the likes. 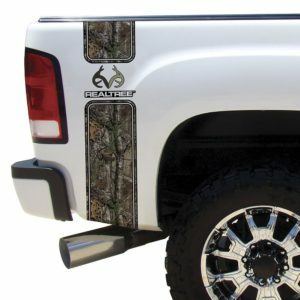 What better way to show your love for the great outdoors than to deck out your ride with the best Camo truck accessories on the market? 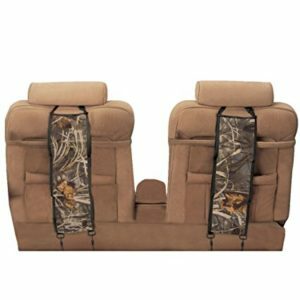 From Camo seat covers to Camo gun holders, you can never have too much Camo truck accessories on your ride! 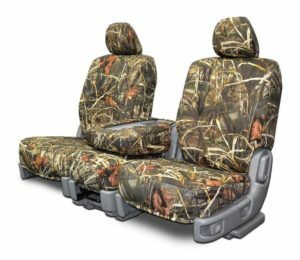 What better way to protect your trucks interior, while also adding personality to your seats, than with a set of high quality Camo seat covers. Not only do they look awesome, they also protect your seats from mud, spills and wear and tear. 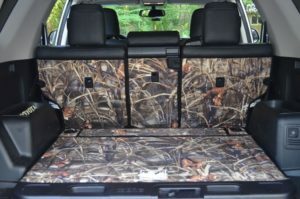 Every truck should have seat covers of some sort fitted, so why not represent the great outdoors with some camouflage. 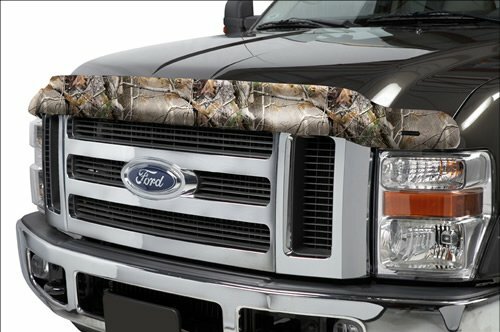 As far as upgrades go for your ride, these are rather inexpensive, making them one of the most popular Camo truck accessories. The price varies depending on whether you opt for a set of custom fitted covers, or universal covers. Just make sure to select your correct vehicle model if you are ordering a custom fitted set! If you live anywhere that has hot summers, then you probably have already seen the damage that the sun causes a vehicles dash. The can have a serious effect on the resale value of your truck, as a dash replacement is far from cheap! Or maybe you already have a faded dash covered in cracks, and are looking to take away the nasty look. If so, then a camo dash cover may be perfect for you. Keeps your vehicles interior at cooler overall temperature during warm weather. 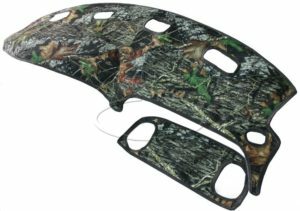 These are also pretty cheap Camo truck accessories that can be purchased custom fitted or as universal dash mat, with the latter being the cheaper option. Lets face it, if you are going to be hauling around anything of significant value in your truck bed, then you want to ensure it’s safety. Whether it be tools, hunting, camping or fishing equipment, nobody wants their valuable possessions stolen. The best way to keep your hands protected from extreme temperatures and protect your steering wheel from wear and tear. 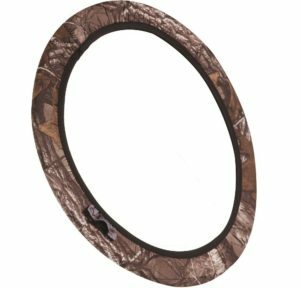 A reinforced steering wheel cover will give your steering wheel maximum durability for all those outdoor pursuits, while the Camo pattern will add a touch of style to your truck. We all want to be able to explore the great outdoors, without having to worry about our trucks cleanliness. Protect your carpet with a set of durable Camo floor mats, which provide adequate protection are easily cleaned. 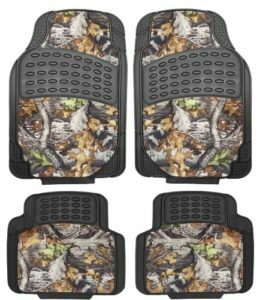 Pair these up with the seat covers and a steering wheel cover to provide maximum protection for your truck’s interior. How cool does these look? I have only recently purchased a set and I love them! I was able to choose between a wide range of Camo patterns to find the set I wanted. They only took about 5 minutes of my Sunday evening to install. Wind deflectors are definitely a worthwhile investment for any truck owner, and the Camo pattern adds that extra touch of greatness. Possibly one of my favorite Camo truck accessories that I have bought so far. You either love them or hate them, but if you want to protect your hood from bugs and stone chips, then they are the best tool for the job! Hood protectors have come a long way since they first came on the market. They have gone from being a flat strip of Plexiglas, to today’s aerodynamic, custom molded masterpieces. Installation is fast and simple. One thing to point out is to make sure you order a bug shield that has UV protection. This is necessary to prevent it from becoming faded by the sun. Most will have this, but I just thought I would mention it in case anybody gets caught off guard. 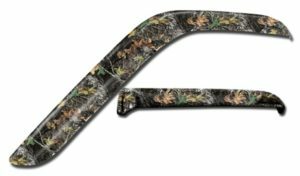 Whether your an avid hunter or an outdoor enthusiast, show your passion with a set of Camo fender flares. These will enhance the body lines of your truck, while preventing muck and debris from spraying up the sides of your rig. They are custom designs to fit specific models and come in an endless choice of patterns. A simple, affordable little upgrade that will let onlookers see your passion for the great outdoors, and help you to blend in with your surroundings. It is important to select the correct model of your vehicle when ordering these to ensure perfect fitment. Installation is simple, even for the less mechanically minded drivers. So, you love camping and you want to purchase a new tent? Or maybe your looking for a new camouflage hunting blind? Why not buy a combination of both? 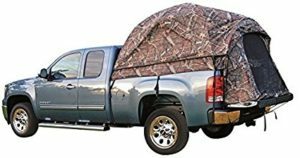 Camo truck tents offer much more benefits compared to normal camping tents. I personally use mine as a nice raised up hunting blind. They offer more than enough space for two people to sit side by side with rifles on bi-pods. There are a wide variety of styles to choose from when looking for a Camo gun rack for your truck. I personally use the triple gun holder that stretches from one side of my truck to the other side, which hangs onto the back of the two front seats. A useful little upgrade that wont break the bank! 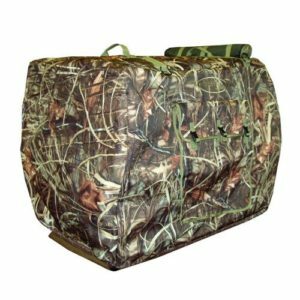 Asides from giving your allowing mans best friend to travel in style, a camo dog kennel cover is also an effective way to keep your dog warm on those frosty winter mornings. My recommendation is to buy a high quality insulated cover to ensure maximum heat retention. There is a wide variety of Camo patterns to choose from. Bonus points for choosing a pattern that matches your truck! 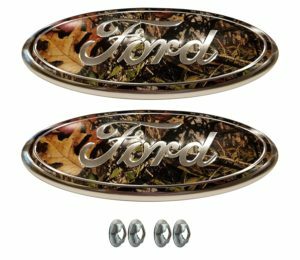 Maybe you already have your ride decked out with Camo truck accessories and your just looking for that finishing touch. Or maybe you would rather keep your truck as close to stock as possible. An upgrade as simple and cheap as Camo badges and emblems can make a world of difference, while not being too ‘in your face’. 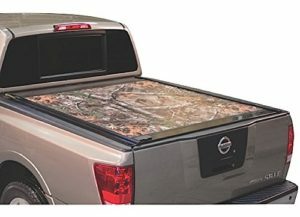 Want a rather inexpensive way to add that Camo touch to your truck? 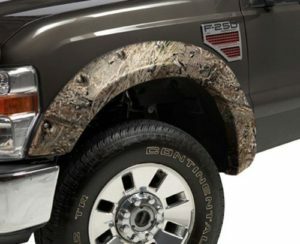 Camo decals offer truck owners the ability to transform the look of their ride, even with a low budget. From full vehicle wraps to small window decals, the possibilities are endless. This is a great way to make your truck truly unique. Well hopefully now you have a few more ideas on how to deck your ride out with the best Camo truck accessories on the market. I will update this list as more items come to mind. Feel free to drop a comment below and tell us what you think of the list. Is there any more accessories that you can think of that you would like to see on the list. Have a look through our Interior, Exterior and Performance sections for more awesome upgrades for your truck. If you have Camo truck and would like to have your picture featured on this article, don’t hesitate to shoot us a message. And as always, keep on Truckin’ Mother Truckers!